Well, my wordpress switch is here!! At first glance things look very much the same which is exactly what I wanted, but check out my “recipe index” tab up above. I LOVE this feature! I also now have a print link at the bottom of my recipes which I’ve been wanting for a long time. So, take a look around!! One bummer is that all of my 600 plus google “foodie friends” wouldn’t transfer over. So please make sure you follow my blog all over again. I appreciated having all of you that accumulated over the year. Thanks everyone!! Sunday night we had this delicious tilapia dinner. We don’t make a whole lot of fish in our house and I’m not sure why. It is so good. We picked up some great tilapia filets at Sprouts Farmer’s Market for pretty inexpensive. Make sure you make the warm tropical salsa I have linked below for the fish. I didn’t make it Sunday night and I wished I would have. It would have topped it off really nicely. Hope you’ll all enjoy!! I’ve been nominated for the “Just Spotted” OC Blog Awards. Vote for me HERE, on the left sidebar of their site under Food/Cooking. Thanks!! 1. Preheat oven to 350 degrees F. Place eggs, water and hot sauce into a bowl; mix to combine. Place flour, salt, pepper and garlic seasoning into a shallow dish. Place cashew, coconut, bread crumbs and salt into another shallow dish. Dip Tilapia into flour, then egg dip and cashew mixture. Make sure fish is coated well with the cashew crust. Place fish onto a baking rack placed over a baking sheet that’s been sprayed with cooking spray. Bake for 20-25 minutes or until fish is easily flaked with a fork and cooked through. 2. Serve with green beans and baby carrots. Dip tilapia in warm tropical salsa if desired. Have a great rest of your week and weekend!! See you soon. 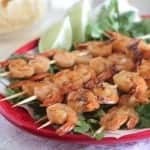 My Shrimp Won A Prize at Southern Living Cook-off! Looks awesome Jenny! I will be trying this one! I am on Grumpy's laptop and don't have the SU here but as soon as I get to work I will come back and stumble your post! I just started to make tilapia, so this is perfect. I am looking for ways to make it. This looks so good and healthy! what a delicious way to enjoy tilapia! YUM! Looks great! Tilapia is one of my favorites. That's an interesting crust for the Tilapia. Sounds pretty good. This looks fabulous. We love, love tilapia. The salsa sounds amazing too. Can't wait to see your new look! Mmm, a cashew and coconut crust on tilapia sounds fabulous! I love wordpress – can't wait to see your new site! 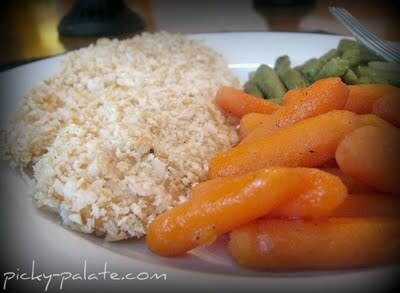 I love coconut encrusted shrimp, so I am sure that I would DEVOUR Coconut Encrusted Tilipia! This looks wonderful and healthy. The new layout looks great! I love WordPress. I’m about to launch my blog using it. Keep up the great work and yummy recipes! Another great recipe Jenny! I tried the tilapia and the carrots! I am NOT a fish person but my 4 year old found fish at the market and wanted me to fix it and I remembered seeing this recipe so I grabbed it. And…drumroll please…I liked it and ate all of my food! 🙂 I didn’t make the salsa since I didn’t have the ingredients but served it with some peach strawberry pineapple jam that I made and it was fine. I had enough eggs/crumb mix that I put it on a pound of chicken too!